This month, I have been leading my church through the book of Philippians. In this book, Paul encourages the Philippian Christians in many ways, and talks to them about having joy despite what their circumstances may present. This letter presented joy in a different way than we see it in our culture. Often, we look at the list of good things that have happened to us, or cite the number of affirmations that people have conveyed. When asked about our level of joy, if we are having a bad day, we may laugh it off and deny that it is there. We know what joy is though… It usually comes on a Friday at 4:30, or when your favorite song comes on the radio. When joy is looked at in this way, I think we completely miss the point. We begin to think that joy fluctuates depending on our mood or what is happening around us. The fact is, joy is more of a decision along with a set of intentional habits. Even more than this, it is a biproduct of a life lived in a healthy and spiritually growing way. God gives us joy when we choose to obey, and follow Him. So, in a way it is a spiritual gift straight from God. I do think, however, there are ways that we can positively feed the joy we have been given. 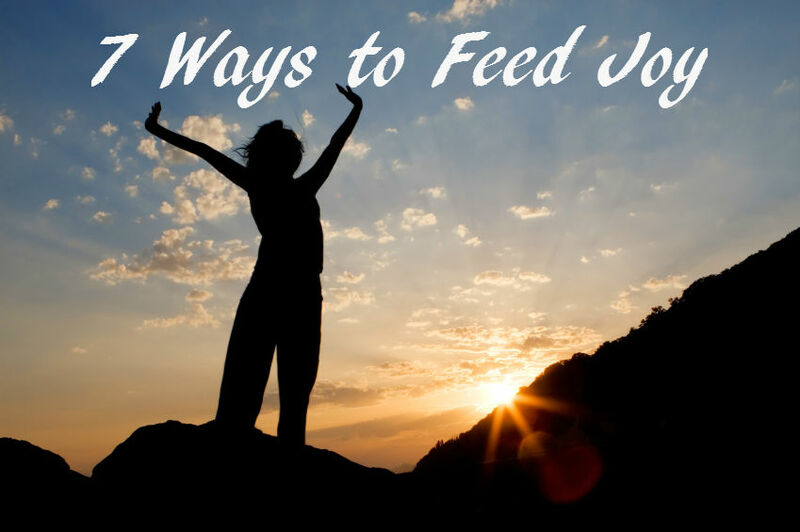 Among many other ways…I think there are 7 ways we can feed our joy. 1. Collect secret places– This week, our family went on a hike at a new park. It had a main trail around a small pond, and it also had narrower trails that split off into different parts of the woods. We decided to take some of these trails to where they lead and a few of them led to a beautiful river. It was so calming and it almost felt like we were the first ones to ever discover this location. It was so quiet and peaceful. I can imagine myself, one day, going to this place to speak with God, and reflect. I think it is important to collect these type of secret places…places that you can escape to for the sole purpose of connecting with God. 2. Give generously– I heard a very wise person once say that giving things away give them true value. Giving feeds our joy, because we are acting in a way that we were designed to act. Whether it be money, possessions, time, or anything else for that matter…sacrifice always gives what we have meaning. God does not bless us to become a hoarder…but to become disciples. Let God use you in this way. Giving will give you joy like you have never experienced. 3. Become addicted to forgiveness– Wait…what? Addicted? Yes. But, what if they misuse my forgiveness, and go on doing wrong. Well…I suppose that is none of your business. You are called to forgive as Christ forgave you. How insulting would it be for us to reject the most precious gift in the universe, because we are trying to prove a point. Granted, there are times that someone hurt us very deeply, and I certainly do not want to diminish this concept, but God’s power, if accepted can give us healing. Forgiveness is an important step in allowing ourselves to be healed. 4. Make a fool of yourself– Sometimes, you just need to have a tea party with your daughter or sing a silly song at the top of your lungs. You spend way too much time trying to network and market your accomplishments…Spend time getting the wiggles out. I think the life we were intended to live in the Garden of Eden was supposed to be this way. We are never too old to play. 5. Lighten up– I have said this so many times to my congregation, and I know they are getting tired of hearing it. “If you are a Christian, filled with joy, don’t forget to tell your face”. It is true. Far too many Christ-followers have the worst attitude and are always pooping on everyone’s parade. It really gets exhausting when you think about it. Why would anyone want to follow a Jesus that makes everyone grumpy? Don’t take yourself so seriously. You only get one life, and you are not doing it better than everyone else. Release yourself of the obligation of needing to be serious all the time. 6. Listen during prayer– God is not a vending machine and your prayer life is not a radio show with God as the audience. Stop it. Take a breath and let Him talk. Many times, when we complain about the fact that God is distant, God is really facepalming Himself because He has been trying to talk to you, but being the gentleman that He is, patiently waits to speak. 7. Expect miracles– Often we pray, but don’t expect anything. This is like ordering a delicious meal from a restaurant and leaving the place before you get your drinks. Why ask if you are not ready to receive? God can do anything, and the answer you need is included. He loves you so much. Let Him work. Much of the world searches for joy around every corner, and neglect the things that feed it the most. Don’t starve your spirit. Walk up to the buffet and dig in!